A giant accumulation of plastic garbage that has been swirling around in the Pacific Ocean has grown to twice the size of Texas since it was discovered in 1972. In the first serious attempt to clean up the mess, a group of researchers has sent a ginormous structure out to sea to swallow the plastic, Pac-Man style. The unbelievably large plastic dump, called the “Great Pacific Garbage Patch,” lies between California and Hawaii. It is the biggest of five around the world that have formed in each of the five oceanic gyres, which are circular systems of ocean currents. More than 8 million tons of plastic pollution creep into the world’s oceans every year. That’s approximately five plastic shopping bags for every foot of coastline in the world. First, smaller plastic is harder to tidy up — think of a spilled box of legos as opposed to a bicycle and helmet. What kind of clean-up machine would be able to pick up so many millions of particles from out of the oceans? The feat is mind-boggling. Second, these tiny plastic pieces enter the food chain and wind up on our seafood platters. Estimates have it that we humans are ingesting millions of microscopic plastic particles a year, causing serious damage to our insides. 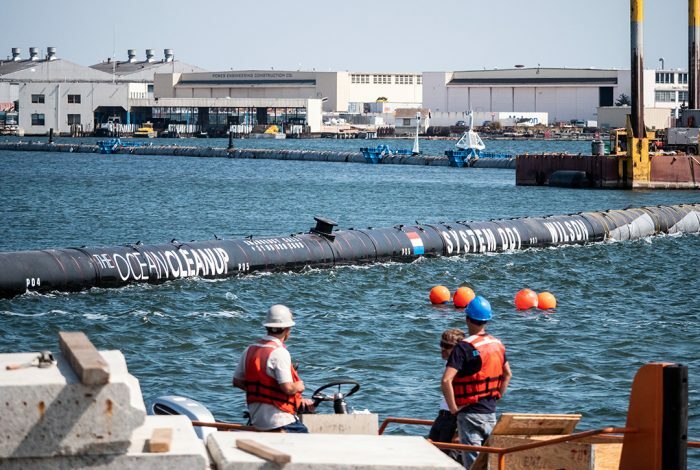 The structure which was launched on September 8 by The Ocean Cleanup project offers a glimmer of hope. Known as System 001, it has been towed through San Francisco Bay and is making its way out toward the Great Pacific Garbage Patch. It was invented by now-24-year-old Boyan Slat, who got the idea at age 16 — surprised to see more plastic than fish while scuba diving. Blat has become a hero in his native Netherlands. The idea is that the structure will mimic a coastline, trapping plastic pieces that come into contact with it. A large flotation device gives buoyancy to a “skirt” hanging below to a depth of about nine feet (three meters). Wind, waves, and currents will propel the structure along at a faster rate than the trash, which is moved only by currents. This greater speed will allow the structure to collect the plastic, much like a whale swallowing its lunch of millions of tiny krill. This large feat of engineering started four years ago with a feasibility study and crowdfunding effort. Since then, extensive research and testing has been conducted, including the successful deployment of a prototype almost 50 miles off the coast of The Netherlands in the choppy waters of the North Sea. The real thing will be put to the test today when it reaches its Pacific test site. The arrival appropriately coincides with World Cleanup Day — wherein millions of volunteers across 150 countries will be out picking up trash in their neighborhoods. Project engineers are confident they can trap very small pieces of plastic as well as the larger ones, and that sea life will be minimally affected, because the structure itself will create a downward current that will carry living creatures out of harm’s way. While the efficacy and durability of System 001 are yet to be measured in situ, it is gratifying to know that some of the world’s best-and-brightest are putting their minds to cleaning up some of the mess we’ve gotten ourselves into. This week’s first video gives you an explanation in cartoon form of what this feat of engineering is, and what it will do for the Pacific Ocean. The second is a time-lapse of the structure being pulled through San Francisco Bay out to the ocean. Related front page panorama photo credit: Adapted by WhoWhatWhy from The Ocean Cleanup computer rendering, close-up (Erwin Zwart / The Ocean Cleanup).